Gennadij Plavinski with a Ben-Yehuda flyer, Glubokoe, 2013. Courtesy of the author. The vestiges of Jewish material heritage are impossible to overlook in the Belorussian landscape. Picturesque old Jewish cemeteries and synagogues, even if derelict, or converted to profane use, testify to the vitality of Jewish life in Belarus, where, at the turn of the twentieth century, Jews made up half of the population in major urban centers. At the same time, the losses Belorussian Jewry suffered in the Holocaust, during the Stalinist "black years," and through massive emigration, made them into the invisible "other" for a long time. The Jewish past is still rarely acknowledged in the public spaces of the country deemed the last dictatorship of Europe, yet, recently, Belorussians have begun to factor their history of multiethnicity into a new vision of national identity through small grassroots initiatives. In September 2012, the town of Glubokoe [Belorussian: Hlybokae], in the north of Belarus, staged the annual Day of Literary Production and Printing. This official festival, organized in a different town every year, brings with it both prestige for the organizing municipality and special funding from the Ministry of Culture. The 2012 festival in Glubokoe reverberated not only locally, but also internationally. 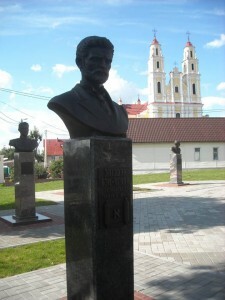 On the initiative of the local executive committee, the statue of Lenin was removed from the central square of the town and replaced with an interethnic "Walk of Fame," featuring busts of eight illustrious citizens of Glubokoe, including Józef Korsak (1590-1643), Polish governor of Glubokoe, Vaclau Lastouski (1883- 1938), historian and prime minister of the Belarussian People's Republic murdered by the Bolsheviks, as well as the father of modern Hebrew, Eliezer Ben-Yehudah (1858-1922). 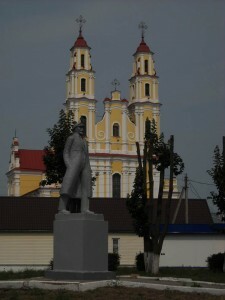 Lenin’s statue in the main square of Glubokoe, 2010. Courtesy of the author. The story of how Ben-Yehudah replaced Lenin in Glubokoe goes back to 2008, when Gennadij Plavinski, a retired engineer and amateur historian, launched a campaign to commemorate the Hebraist who lived and studied in Glubokoe in the 1870s. Before the Second World War, nearly 60% of 12,000 inhabitants of Glubokoe were Jews. After the war, only the old Jewish cemetery and a modest monument to the victims of the local ghetto reminded the inhabitants about centuries of Jewish presence in the town. For Gennadij Plavinski, who has Polish roots and is Catholic, the monuments of Jewish death were not enough in a town that once had so much Jewish life. 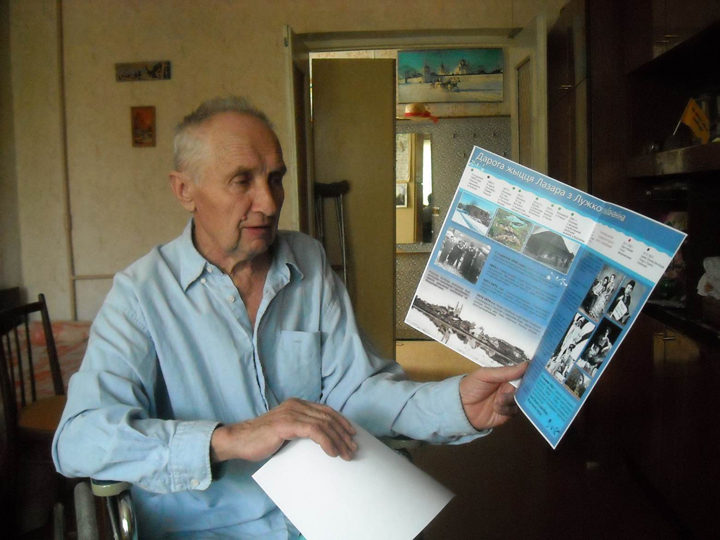 Going from door to door, he started gathering signatures for a petition to the local authorities; publishing articles about the life of Ben-Yehudah in the local oppositional press and distributing flyers documenting Ben- Yehudah's childhood and youth in Belarus. Four years later, and rather unexpectedly for Gennadij, the local authorities decided to include Ben-Yehudah in the local pantheon. Gennadij was never formally acknowledged for his involvement, but he is grateful to the authorities for their unorthodox decision and considers it no less than a miracle that the monument supplanted Lenin himself. The disappearance of the statue of Lenin, which on the occasion was removed "for conservation," is as telling as the choice of the distinguished men who took his place: a veteran of the Polish campaign against Moscow, a Belarussian nationalist, and a Zionist. The Glubokoe "Walk of Fame" not only symbolically rehabilitated the hitherto forgotten and "politically incorrect" protagonists of Belorussian history, but it also replaced the Soviet narrative of Communist unity with a vision of multiculturalism and ethnic diversity. Projects that include Jews in the narrative of Belorussian history have also taken place on the initiative of Jewish institutions. The Jewish Museum in Minsk, for example, has in the last few years prepared a number of exhibitions and publications about Jews in the Belorussian antifascist resistance units. The anti-Lukashenko opposition has made similar gestures. The Belarus Free Theatre Publishing House, associated with the internationally renowned underground theatre company of the same name, published in 2009 One of Us, a biographical dictionary of prominent Belorussians. Out of twenty-six entries, ten are biographies of Jews, including Isaac Asimov, Marc Chagall, Kirk Douglas, Shimon Peres, Menachem Begin, and Eliezer Ben-Yehudah. The dictionary likewise lists a number of ethnic Poles, such as the heroine of the 1830 anti-Russian uprising, Emilia Plater, or the geologist Ignacy Domeyko. In the introduction the editors state their intention to establish a Belorussian national pantheon. By listing famous artists, writers, politicians, and scientists who came from Belarus, they hope to foster national pride and articulate a political message. "A country that has given the world so many geniuses, can and indeed should transform into a civilized, modern and sensible state." The multiethnic heritage is thus interpreted as a legacy of modernization and enlightenment that should inspire political change in Belarus. The monument of Ben-Yehuda in the main square of Glubokoe, 2013. Courtesy of the author. Ben-Yehudah's entry into the Belorussian pantheon has one more dimension. As a result of intensive Soviet Russification campaigns and current language politics, only 23.4% of Belorussians speak Belorussian fluently and less than 4% use it constantly in their daily life. The reviver of Hebrew thus appears to many as a role model. When the governor of Vitebsk opened the Glubokoe "Walk of Fame," delivering his speech entirely in Belarussian, he sent a clear message about how much the new memorial was part of a nationalist project. During a conference devoted to the work of Ben-Yehudah, organized 2013 in his birthplace, Luzhki, author Pavel Kastiukievich went so far as to state that the situation of today's Belorussian is comparable with the state of Hebrew in the late nineteenth century. In the same vein, the journalist of the oppositional monthly Bat'kaushchina (Fatherland), Zmicer Lupach, wrote that "Eliezer Ben-Yehudah and his biography could serve us all as an example." Clearly, part of the new local fascination with Ben-Yehudah has to do with the inspirational potential that his project of reviving Hebrew has for those campaigning for a rebirth of Belorussian today. The tradition of multilingualism and the linguistic diversity of Belorussian cultural and intellectual life before the Second World War today inspires both the activists dedicated to preserving Jewish heritage in Belarus and the anti-Lukashenko oppositionists, who resent the dominance of Russian in the public domain. Although the grassroots projects commemorating the Jewish past devote certain attention to Jewish languages, Jewish memory projects in Belarus have the revival of Belorussian language high on the agenda. The grassroots projects devoted to Jewish heritage in places like Glubokoe reveal a wider interface between the new interest in the Jewish past and the highly politicized Belorussian national identity project. Public historians championing the importance of Jewish history in Belarus today not only frame Jewish history as an integral part of the Belorussian past, but also define Belorussianness itself via the federalist, multiethnic and multireligious heritage of the Great Duchy of Lithuania. This vision resonates with the anti-Lukashenko opposition which places Belarus in the realm of European cultural influence and cherishes the myth of the harmonious coexistence of various ethnic groups within the Polish- Lithuanian Commonwealth. Paradoxically enough, the narrative of Belarus's multiethnic heritage also strikes a chord with the official authorities who see the foundational myth of Belarus in the Belarussian Soviet Socialist Republic and gesture towards its early ideals of ethnic equality. The current initiative to create a central Holocaust memorial space in Trostenets, just outside of Minsk, exemplifies the attempt of the Belorussian authorities to acknowledge the singularity of the Jewish suffering in the Second World War. The high profile of this project, realized with significant financial support from Germany and Austria, suggests that commemorating Jews in today's Belarus has important implications for the country's international relations and its image abroad. As the head of the Minsk municipal administration, Sergej Chilman, recently put it, "[the Trostenets monument] has a great meaning for Belarus's cooperation with Germany and Austria and the development of friendly relations between our states." The commemoration initiative in Trostenets, supported personally by the German president, Joachim Gauck, has a chance of becoming a flagship memorial project, which can help the Lukashenko regime to present itself as pursuing progressive memory politics and being open for international cooperation. It remains to be seen if the small grassroots initiatives and the foreign-funded projects can inspire Belorussians to fill in the gaps in their historiography concerning the dark chapters of Belorussian-Jewish relations and help them address the problems of contemporary Belorussian Jews. Even though the authorities have undertaken some steps to counteract anti-Semitism, prosecuting neo-Nazis and closing down an anti-Semitic publishing house, there is no state support for Jewish culture and education and the burning question of the restitution of Jewish real estate has not yet been addressed. If Ben- Yehudah is to be the patron of this Belorussian change, let us hope that starting small can be the harbinger of bigger things to come. Magdalena Waligórska is assistant professor of East-European History and Culture at the University of Bremen, Germany. She is the author of Klezmer's Afterlife: An Ethnography of the Jewish Music Revival in Poland and Germany (Oxford University Press, 2013).